The Hoover Deep Cleansing Detergent AH30110 has a special formula that penetrates deep into carpet fibers to really give it a thorough clean and remove even the toughest stains and grime. It can be used with all carpet-cleaning machines and it leaves a fresh, clean scent in the room. All carpet cleaning machines that we review are able to use this stuff. It’s a good, standard, deep cleansing detergent. With a cleansing formula that is tough enough for heavy-traffic areas, this carpet detergent is versatile and can also be used on upholstery and car interiors. Read on to learn more about this one. 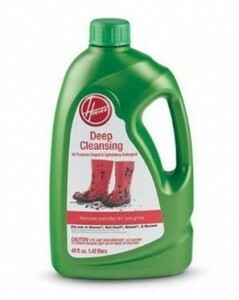 So far, the Hoover Deep Cleansing Detergent AH30110 has only gathered 25 customer reviews on Amazon.com. Most reviewers gave high ratings, praising the product for its fairly effective cleaning power. Not very good at removing deep stains – One reviewer thought the product was just okay, but it didn’t really impress when it came to removing stubborn stains. This consumer thought that the detergent is a bit overpriced and it doesn’t seem to be any better than other cheaper cleansing detergents in the market. Doesn’t seem effective with pet urine – Another Amazon user also reported that they did not succeed in using this detergent to remove dog urine from the carpet. It still left a stain and a faint urine smell after use. Cleans well – Although some reviewers admit that this product seems to have some difficulty removing heavier stains, they are generally pleased with how it cleans. Getting rid of dirt and grime is quick and easy. Pleasant scent – Users were also pleased that this detergent doesn’t have that overpowering smell most cleaning liquids usually have. Generally, the Hoover Deep Cleansing Detergent is a fairly good product. Some customers have noted that it does not seem that effective at removing tougher stains, but it does a great job of removing dirt that isn’t too deep-seated. If all you need to do is freshen up your carpet or make it look a few shades lighter, this detergent can do the trick.